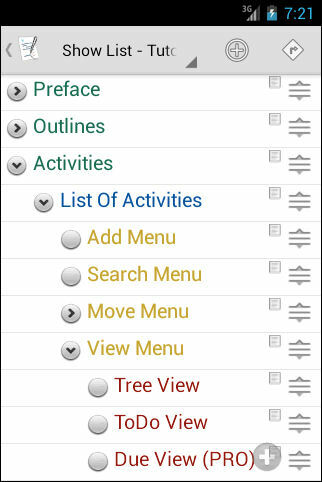 Organize shopping lists, tasks, todo-lists, ideas and all kinds of memos. For easier distinguishing the levels of the list of activities you can now configure the Outline to show Level Colors (PRO only). In "Config Outline, Color" you enable this feature. "Level Colors" gives the first four levels of the Outline a certain color. Outliner suggests sensible default colors depending on your chosen theme (Light/Dark) if you enable Level Colors. 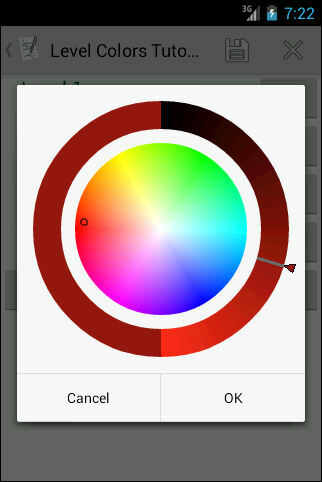 However, you can choose your own colors by pressing the small button right to the color-listbox. For each level you can choose a color with a color wheel. The big middle circle is the general color and the half-round slider at the right side is the lightness. The half-round area at the left shows the chosen color. "Default" switches back to the default colors for this Outline. If you don't want to use any colors at all, change the configuration to "No Outline Colors". Use Outliner as your inbox for things you want to remember or things you just found while surfing. First configure one of your Outlines as inbox in the settings. Then for instance share a website and choose Outliner as sharing target. The link is added in Outliners inbox as a new activity. Google Play Store Link here. Google Play Store Browser Link here. Feel free to donate via PayPal to support further development. Idea for the future. Allow organizing Built outlines into an outline structure itself. It would be helpful to be able to use a "folder like" approach for outlines. Idea/question. How to open a "built" outline from Android. I am afraid of nuking mine. Seems you have to create an outline in Android w/ same name, then configure it to sync w/ Dropbox. Lost my phone so worried how to do it on a new setup. Thanks for sharing content and such nice information for me. I hope you will share some more content about. Please keep sharing!